Whew! If you’ve been paying attention to the Mac Gems Weblog for the past six weeks, you know that it’s been home to GemFest 2009, a Gem-a-day marathon of over 50 Gem reviews. We ended GemFest 2009 on Tuesday with a quick rundown of some of our all-time-favorite Gems, and today marks our return to the regular two-Gems-each-week schedule. I’ll get back to reviewing great, inexpensive Mac software next week, but today I’m going to tell you about an accessory Gem that I’ve been wanting to cover since I saw a prototype at Macworld Expo back in January. As someone with a laptop, several external hard drives, and a handful of other accessories that are frequently connected and disconnected, one of my most-frequently-suffered computing annoyances is cables that fall behind my desk, forcing me to crawl underneath or sprawl across the top to retrieve them. (I can’t count the number of times I’ve lunged at a loose MagSafe power cord just as it’s about to slip over the edge, out of easy reach.) Over the years I’ve devised various makeshift mechanisms to prevent such mishaps: twist-tying cables together so that plugged-in cables will keep the others from falling; taping or nailing homemade cable clips to the desk; lodging loose cables under paperweights or other gear…the list is long. While most of these methods have worked, they’ve also tended to be ugly, kludgy, or a hassle to use—or a combination of the three. Bluelounge’s CableDrop is the kind of solution I’ve been looking for. Each is a cute, rubber-like cable clasp, about one inch in diameter, with an adhesive back. You stick a CableDrop to your desk, to the wall behind it, or even to other items on the desk, and it keeps one or more cables—depending on the thickness of each cable—from falling. The clip’s “jaws” are sturdy enough to secure even the thickest FireWire cable, or several thin ones, but flexible enough that it’s easy to get cables in and out of the clip when needed. 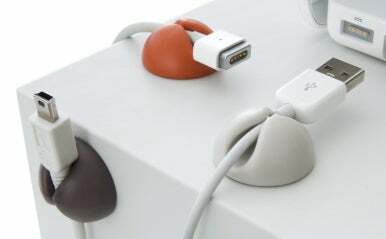 Bluelounge suggests CableDrops are also useful for routing cables to keep them out of sight and for storing earbuds (via a CableDrop stuck to the side of your desk or display) when not in use. I also recommend them for keeping track of which identically-looking cable connects to which device. When I saw the prototype of a CableDrop at the Expo, I thought it was a great idea, but I was afraid that, like so many cool-but-simple accessories, Bluelounge would price the product at a premium. Thankfully, that isn’t the case, as a six-pack of CableDrops is only $10—a reasonable price, in my opinion, for a clever, useful, and attractive product. And in a welcome reprieve from expensive shipping rates for inexpensive items, that six-pack costs only $1.73 to ship via First Class Mail (to Macworld’s San Francisco offices, at least); two sets cost just $2.24 to ship. You can get CableDrops in either of two color sets: Muted, which includes two each of beige, orange, and brown; and Bright, which includes two each of gold-yellow, pink, and lime-green. After testing out the review pack we received, I’m planning on buying a couple packs myself—and getting rid of the twist-ties, masking tape, metal clips, and paperweights.